Ernie Grunfeld... I'm here to save your job... Now, where is the basket? I was so tempted to add this to the list but I'm still debating if this was a good trade or not after days of finding out the news. After taking a preseason to find out that his 2010-2011 draft picks failed to fill the role left by Emeka Okafor's injury something had to be done to save Ernie Grunfeld's job the season. Ernie Grunfeld sends injured Emeka Okafor and a protected top 12 1st round pick to Phoenix for Marcin Gortat and a bag of beans. 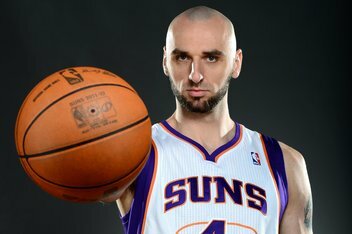 I am excited to have Gortat on a team that is in dire need of a Center. Keveen Seraphin and Jan Vesely's (lol) play was not what we expect from a potential playoff team but was it really worth a top 12 protected pick whom many say is a loaded draft in 2014? At the same time as history shows Grunfeld cannot pick outside the top 3 anyways. Should I over value another future failed pick? Did Ernie undervalue that first round pick and Okafor's expiring contract? It could have been used for something bigger at the trade deadline like maybe a LaMarcus Aldridge. We no longer have that 1st round pick and large expiring contract to dangle for an even bigger trade. If Ernie doesn't do this trade we'll fall into another depressing season (which I don't think I can take anymore). Too many questions and it only can get answered Wednesday night. So for now this Ernie Grunfeld decision is "Still Pending..."
This entry was posted on Tuesday, October 29, 2013. You can follow any responses to this entry through the RSS 2.0. You can leave a response.